Late September sunset (fractionally south of west) over the sea, through the trees during the CQWW RTTY Contest weekend. 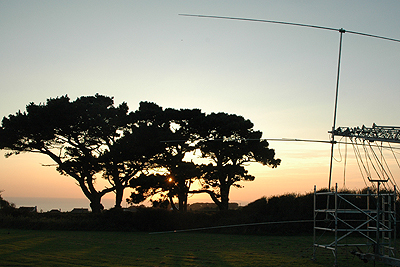 The 3el 20m beam was wound up at sunset on the Friday evening. 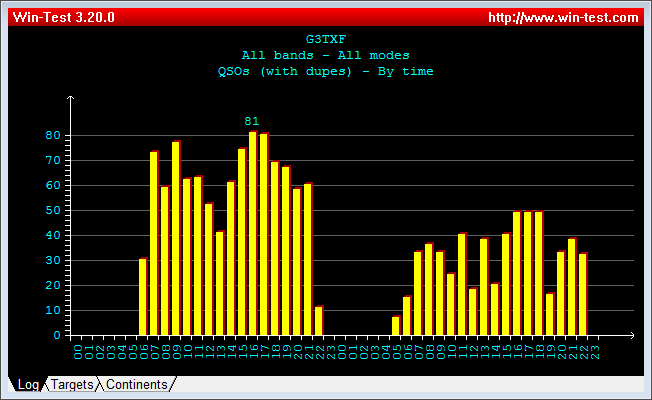 A 3-el 20m yagi at 80ft was used for G3TXF's second entry in the CQWW RTTY Contest. 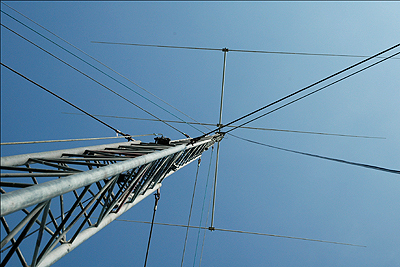 This RTTY Contest is growing substantially in popularity and will soon rival its elder SSB and CW brothers. The top-20 QSO countries are shown in this table with the non-EU totals in bold. Surprisingly more XEs (9) were worked than G's (8)! Zones missed (8) : 02, 12, 23, 29, 34, 35, 37 and 39. Total claimed mult (187) was 99 countries, 32 Zones and 56 States/Provs. W/VE mults missed (6) : WY VO2, VE5, VE8, VY1 and VY0. The excellent graphs produced by Win-Test show that the QSO distribution for the two days with the first QSO on both days just around 06z, but with a much reduced level of activity on the Sunday. 1,011 Qs were made on Saturday compared with just 559 Qs on the Sunday. The best hourly (16z Saturday) was 81.